As implied by their title, the Greybeards are usually quite elderly, as it takes them years of study to harness their power, and thanks to their lifestyles, they often live to ripe old ages. 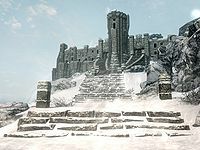 They have always been a small group, consisting of only a handful of members at any given time, and they have no real place in the political structure of Skyrim. Nevertheless, they are highly respected by all Nords, and on those rare occasions when they give blessings, advice, or counsel, they need no color of law to be heeded. They have even commanded respect from the most jaded and misanthropic of elves. The combined voice of the Greybeards is a thing of legend. One says that their shout once blasted Ysmir Wulfharth into ash. According to another legend, Tiber Septim led the invasion of Old Hrol'dan and used the power of his Voice for the first time while reclaiming the town from the Witchmen of High Rock. Storms brewed as, far away, the Greybeards prepared to speak, summoning Tiber to the mountain. As the nearby citizens evacuated, Talos approached the Greybeards' home. When the Greybeards spoke Talos' name, it is said that the world shook. They called him Ysmir, Dragon of the North, and told him that he would rule Tamriel, but he needed to go south, to Cyrodiil, to do so. Over six centuries later, in 4E 201, the Last Dragonborn used the Voice for the first time after defeating a dragon which threatened Whiterun. Like they had done for Talos, the Greybeards called the hero to High Hrothgar. After much instruction, testing, and guidance, they spoke together to once again formally recognize Ysmir, Dragon of the North. They continued to guide and assist the Last Dragonborn in the quest to defeat Alduin. Despite this intervention, they were criticized by some for not becoming more involved in Skyrim's affairs. They have been bitter enemies of the Blades since the Blades first came to Tamriel as the Akaviri Dragonguard. The Blades despise the Greybeards for their inaction and for protecting the Blades' enemy. The Greybeards, for their part, distrust and fear the Blades, viewing them as genocidal meddlers, a cabal of bloodthirsty Akaviri barbarians, who have always sought to turn the Dragonborn away from the path of wisdom. The two groups vied for influence over the Last Dragonborn, but who the champion favored is unclear. 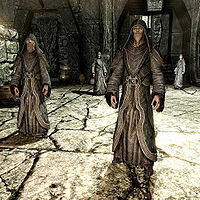 The Greybeards viewed the Elder Scrolls as "blasphemies" with which followers of the Way should not concern themselves. During the late Third Era, the Greybeards spoke of the "end of all times", possibly referencing the future events that took place during the Oblivion Crisis and the return of Alduin.